KVH Industries, Inc.'s, (Nasdaq: KVHI) announced that their new TracPhone® V11-HTS is the world’s fastest 1 meter Ku/C-band maritime VSAT antenna, that delivers data speeds as fast as 20 Mbps down/3 Mbps up to commercial maritime vessels and superyachts around the world. These high speeds are critical for services such as videoconferencing, video chat, telemedicine, web browsing, and allocated crew usage. Because of the demands of Internet of Things (IoT) applications, and crew connectivity these fast data speeds are necessary to support the critical needs of commercial ships' operations. Additionally, superyacht guests appreciate the fast connectivity for streaming HD content and accessing internet and social media platforms at sea. Designed, engineered, and manufactured by this mobile tech company, KVH, the TracPhone V11-HTS offers a dual Ku-/C-band design with automatic switching to deliver expanded global coverage, including Northern and Southern latitudes, and reliable connectivity, even in extreme weather. In addition, the antenna system features the Integrated CommBox Modem (ICM), a streamlined belowdecks unit including high-throughput modem, Voice over IP (VoIP) adapter, CommBox™ network management software, and built-in Wi-Fi and Ethernet. The ICM also receives onboard news, entertainment, and operations content sent via KVH’s IP-MobileCast™ content delivery service. Martin Kits van Heyningen, chief executive officer of KVH commented that with the TracPhone V11-HTS, they continue to bring innovative solutions to the maritime market, enabling commercial vessel operators to take advantage of the many benefits of VSAT, such as IoT applications and business efficiency, while yacht captains can offer guests onboard KVH’s fastest connectivity at sea. From their advanced mini-VSAT Broadbandsm HTS network to their 24/7 tech support, their superior connectivity solution makes broadband at sea seamless. 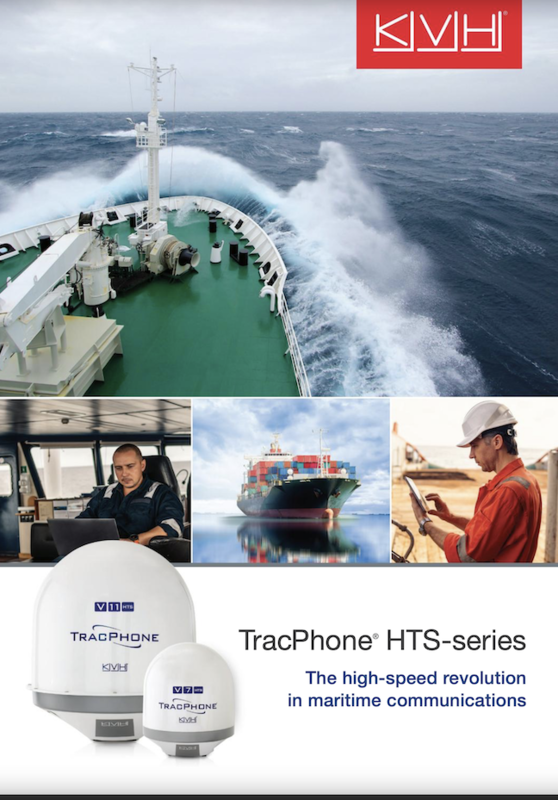 The TracPhone V11-HTS adds to KVH’s HTS family of maritime VSAT antennas, which includes the 60 cm diameter, Ku-band TracPhone V7-HTS and the 37 cm diameter, Ku-band TracPhone V3-HTS. The variety in KVH’s HTS antenna family provides a system suitable for nearly any size boat, yacht, or ship—from a 30-foot sportfishing boat used along the coast, to a 150-foot superyacht cruising in the Mediterranean, to a 1,000-foot freighter traveling the world’s shipping routes.